America in the 1950s was at a crossroads, caught between technology and tradition. At the same time that it was looking ahead to the promise of “better living through chemistry,” it was also looking behind, with nostalgia, to a distant past. Home decorative fabrics of the era reflected this duality. 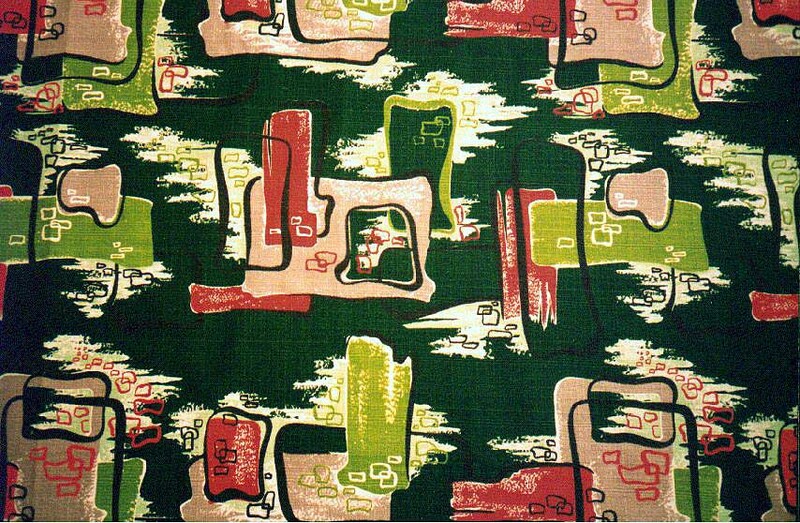 Printed textiles included images of modern art and science, like mobiles and Sputniks, along with Old West motifs, and the folk paintings of Grandma Moses. 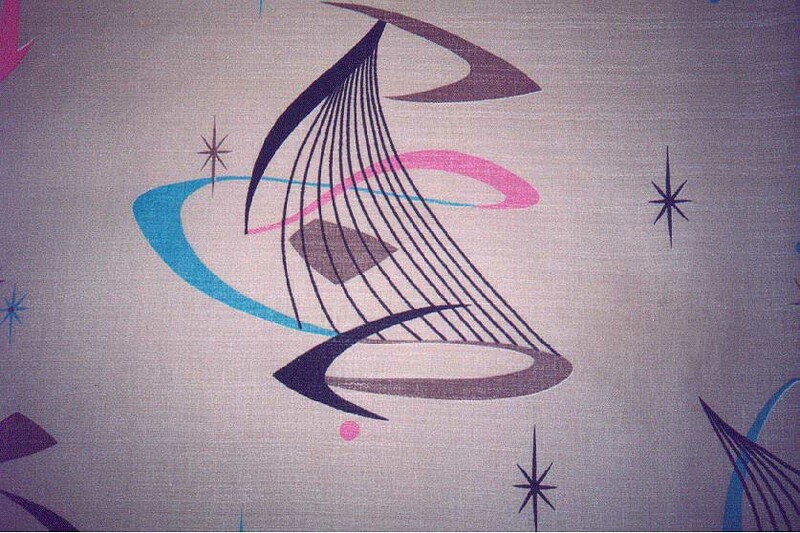 Often these radically different designs were used together: boomerang drapes in the living room, with cowboy curtains in the den. The former symbolized a faith in speed and science, the latter a yearning for a slower-paced home on the range. The exhibit explores these opposing trends, as well as the influence of popular culture on this art for the masses. 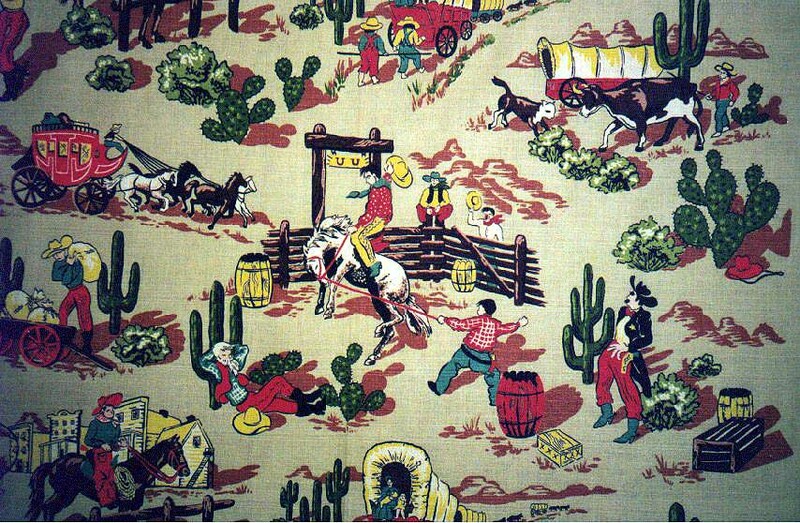 This Cofabco print combines the stock characters of a typical tv western, in- cluding sheriffs, sidekicks, women, and children, as well as the traditional cowboy- heros. 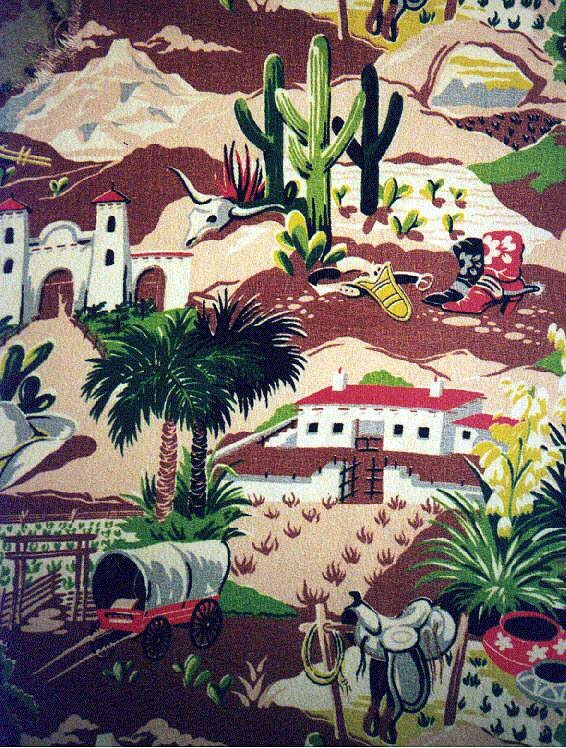 An early 1950's Spectrum barkcloth print provides another take on the Old West, with scenes of missions and mountains, boots and saddles, but minus the cowboys. 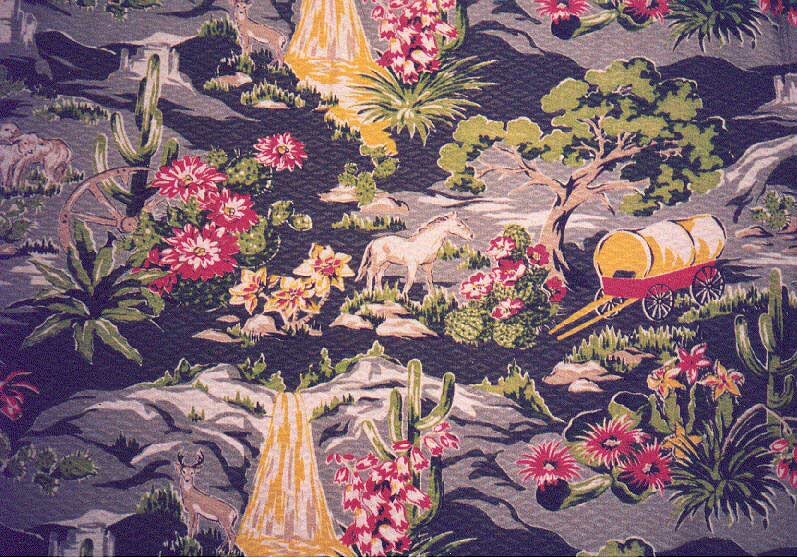 Some of the motifs in this print -- wagons, cactus and mountains -- bear a striking resemblance to those in the previous Spectrum print. Notice its honeycomb diamond weave. 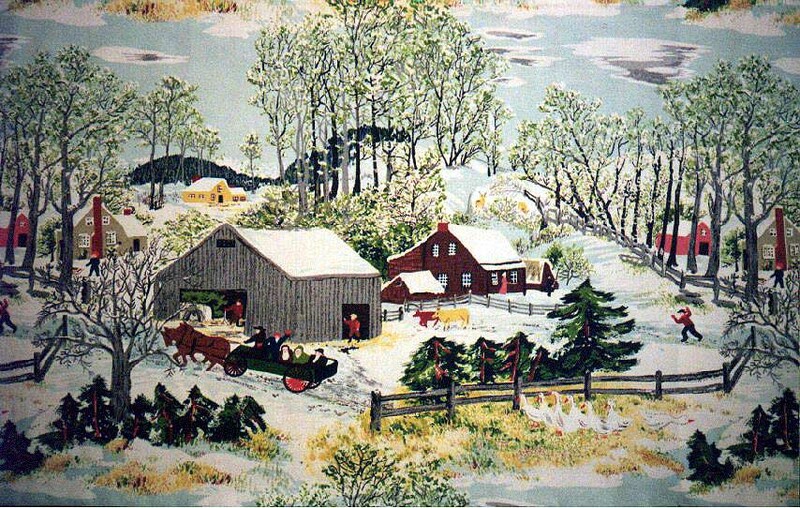 Grandma Moses, a self- taught painter, became the most beloved artist in post- war America. Riverdale Fabrics reproduced a number of her paintings, including "Early Springtime on the Farm." Other textile manufacturers jumped on the farm wagon. 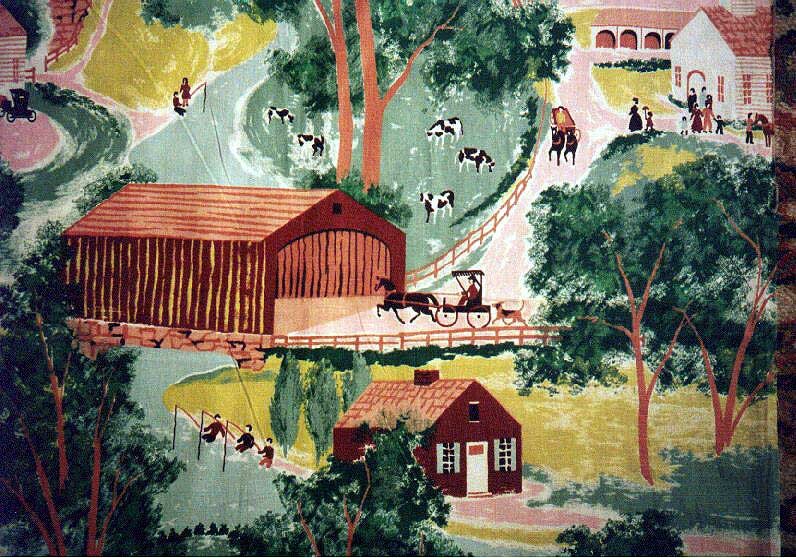 Waverly Bonded Fabrics' "Covered Bridge" offers another idyllic view of life in the country. 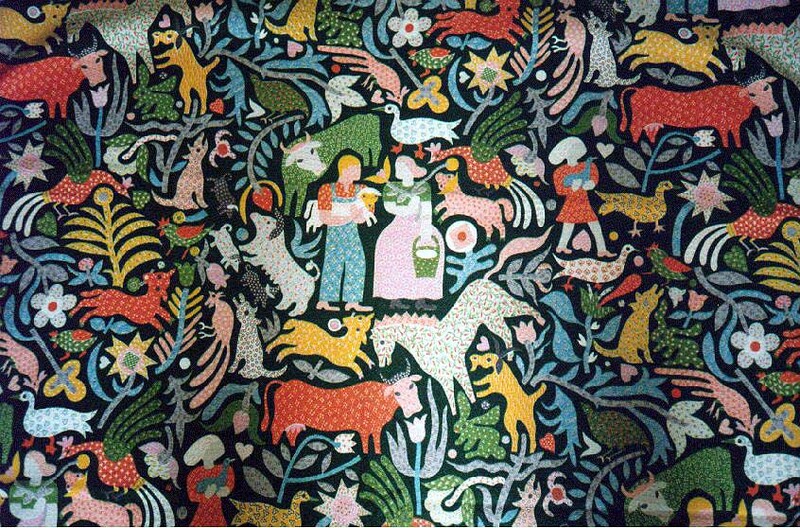 Although most fabric designers remain anonymous, the name of Ilonka Karacz of Associated American Artists appears on the selvage of Riverdale Fabrics' 1952 "Calico Cow," a sophisticated folk-art print. Are these dancing test tubes or alien space craft? America in the 50's was preoccupied with these and other scientific icons. 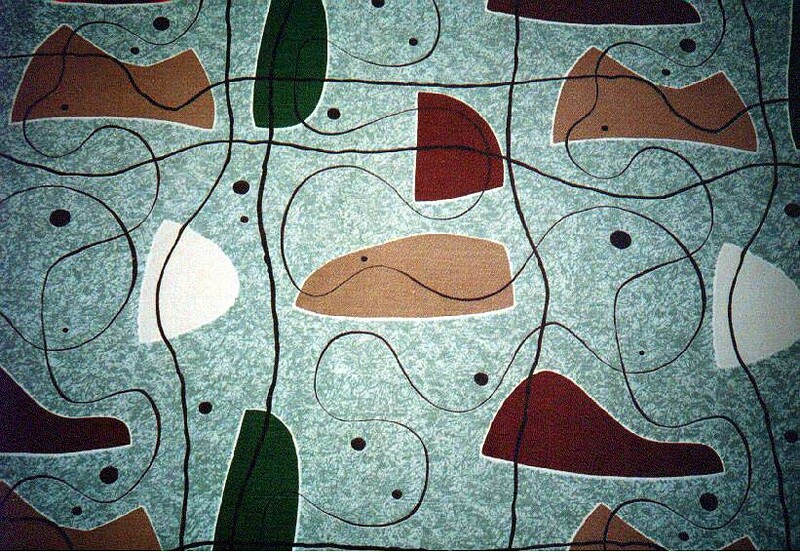 Amorphous shapes seemingly float through a connect-the-dots landscape in this mid 1950's pebblecloth. Spirals, starbursts and boomerangs were symbols of our early attempts at space exploration. 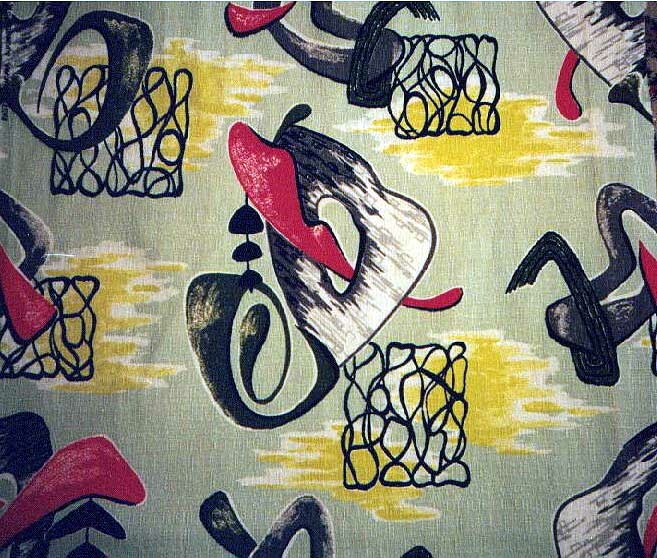 In this print named "El Cara," a mobile is juxtaposed with wire grills, hot peppers and other abstract shapes. 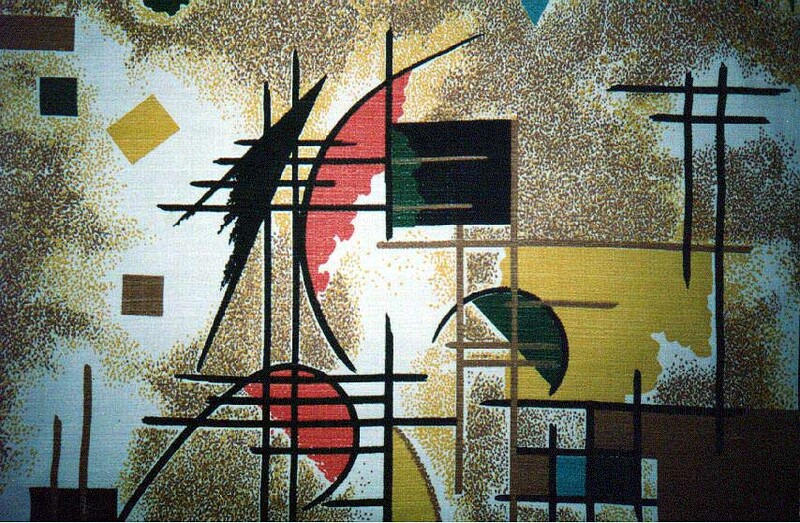 Textile patterns were influenced by Mondrian and other modern artists. 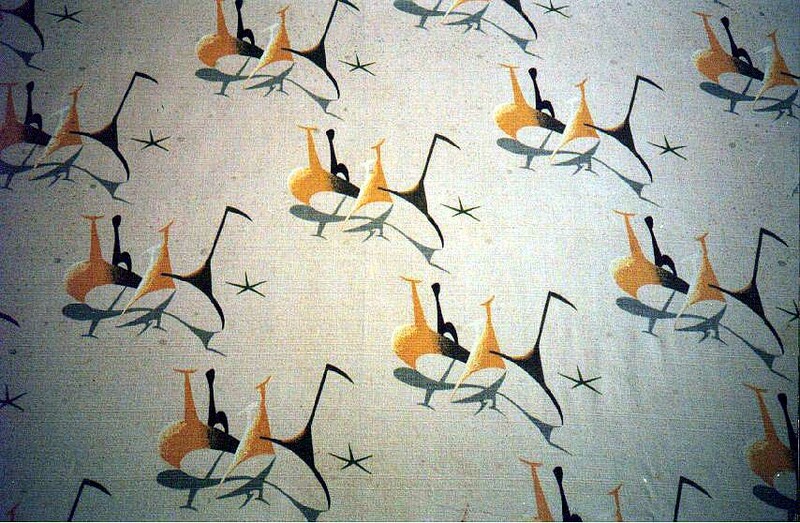 Although this 1959 barkcloth contains elements of modern art, the shapes are vaguely reminiscent of cowboy hats, boots and tv sets.